When I found the 18-inch Professional Microfiber Mop from Microfiber Wholesale, I was delighted with four features right away. 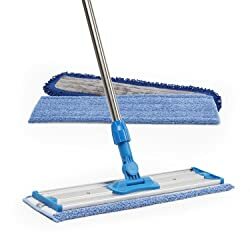 This is definitely one of the best spin mop (360 spin mop) I’ve ever used to clean my home. Remember those string mops everyone used to clean their floors? They were hard to wring out and difficult to control. They harbored bad smells, tangled and knotted up, and weren’t easy to clean. I tossed out all of our old mops and upgraded my family to a new and better way to clean our house. There are many easy-to-use mops available now. It’s actually a little hard to choose between them. I researched the best mops on the market and narrowed down my selection to four. I’d like to tell you about them all, beginning with the mop that my family is currently using and enjoying. 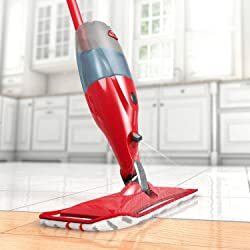 When I found the 18-inch Professional Microfiber Mop from Microfiber Wholesale as the best spin mop for my house, I was delighted with four features right away. First, the wide width meant that I could clean floors quickly in record time. Second, the rectangular format meant it would be easy to clean corners. Third, the handle length is adjustable so that either adult or children helping with chores, can comfortably clean. And fourth, the mop came with both a dusting pad and two wet mop pads. The dust mop pad is perfect for dusting pet hair and crumbs from wood and tile floors. A quick pass with the vacuum and the debris I just gathered up is gone. The pad is ready for more work. It’s a lot better than a Swiffer (in my opinion) because it covers more area faster, and the pads are washable and reusable. This isn’t your typical wet mop, either. It’s too large to fit in a normal bucket. But I’ve found that using a bucket isn’t necessary. When I want to wet mop, I dust first with the dry pad. Then I dampen a wet mop pad and mount it on the mop. I mix up a cleaning solution in a spray bottle and spritz the floor as I mop. After all the floors are clean, I toss both pads into the washing machine and then let them air dry. I love this method of cleaning because there is no heavy bucket with filthy water to empty. The mop is strong and resistant to rust because it’s made of stainless steel. It’s super simple to attach and remove pads – just press the mop onto them or pull them off the mop. This is definitely one of the easiest tools I’ve ever used to clean my home. 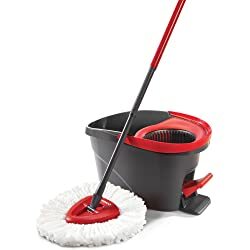 While my family is making good use of this best 360 spin mop, you may prefer a mop that is even easier to wet and use like the O-Cedar described below. The O-Cedar ProMist Microfiber Spray Mop doesn’t need a bucket for wet mopping. It comes with a refillable bottle where you can mix and mount your own cleaning solution. As you clean the floor, squeeze the trigger in the handle to spray cleaner in a wide path in front of the mop. The microfiber pad that comes with the mop has raised “scrub zones” little brush-like protrusions, that help clean grimy areas. The pad is machine-washable, just like the ones that come with the mop my family is using (above). While you can use the O-Cedar to dust floors, it’s really designed to be an all-in-one tool for wet mopping. It has a head that swivels 360 degrees so you can get into all those tight corners. I decided against this mop for a few reasons. One, while the pads are reusable, they can only be washed up to 100 times. The mop head is about the size of a Swiffer, quite a bit smaller than the 18-inch mop we purchased for our home. And there have been some complaints that the cleaning solution tends to leak. If spraying liquid on the floor doesn’t sound as good as using an old-fashioned bucket, take a look at the Mopnado reviewed below. I admit that the Mopnado caught my eye for a long time. It’s quite the cleaning tool as you can use it for floors or on walls or windows. Like our 18-inch mop, the Mopnado also has a handle that adjusts to different lengths, out to 56-inches total. But that’s about all the similarity there is. The Mopnado comes with a bucket because it’s only a wet mop. This is one of the reasons I chose the 18-inch mop from Microfiber Wholesale – it has the flexibility to do wet and drop mopping. But as a wet mop, the Mopnado shines. The bucket itself is a wonder. The spin dry basket is made from stainless steel to make it super strong and keep it from retaining odors. The bucket has a spin agitation system on the bottom to pull dirt from the mop head while you rinse it. You can move from room to room without straining your back because the heavy-duty plastic bucket has wheels and a retractable handle. There’s even a built-in soap dispenser system. The mop handle is also full of surprises. It has gears inside the mop head that make it easier to rinse and wring out the mop. The head swivels 180 degrees or locks in place so you can clean windows with it, too. It comes with a scrubber brush attachment and two microfiber mop heads that are machine-washable. Mopnado offers a 1-year warranty. They say their mop pads last 6 to 8 months and they sell refills. If the Mopnado is a little more than you need, you might enjoy the O-Cedar Spin Mop below. Besides their ProMist Spray Mop described above, O-Cedar also sells this Easy Wring 360 Spin Mop and Bucket system. When it’s time to wring out the mop, you pedal with your foot on the lever to spin the basket and dry the mop pad. The splash guard helps keep the water in the bucket as you rinse and wring. The microfiber mop pad is machine-washable, but users report that it’s a bit difficult to separate from the mop head. The mop head and pad have a triangular shape and they pivot to better clean corners and tight areas. Like my mop and the Mopnado, this one has an extendable handle, but it only reaches 51 inches for its maximum length. One other downside to this mop is that I found a few reports where users said the pedal broke after some months of use. One other downside to this mop is that I found a few reports where users said the pedal broke after some months of use, but I guess that’s just in the case they stepped their foot too hard. Now that you’ve seen my top picks for mops, here are the features I used to help me decide. I wanted a mop that would be simple to use and easy to maintain. I have people of all ages at home and most of them help with the chores. Reusable pads were a priority because they keep costs down and are better for the environment. I like multi-purpose tools, so the ability to do both dusting and wet mopping is definitely a bonus. It saves me money and time to have one mop for both jobs. Replaceable parts, like mop pads, needed to be readily available and not too expensive. To conclude this review, I would like to quickly recap the highlights of each mop for you. The 18-inch Professional Microfiber Mop from Microfiber Wholesale is the one I chose for my home. It has a wide rectangular mop head that pivots and a long, adjustable-length handle. Mop pads are machine-washable and very easy to remove and mount. I can dust the floors and wet mop them with the same tool. The O-Cedar ProMist Microfiber Spray Mop has a wide-mouth refillable bottle that holds your cleaning solution. You can spray the liquid onto the floor in front of the mop so you don’t need a bucket. The microfiber pads are machine-washable and have a raised scrubby texture. The Mopnado Stainless Steel Deluxe Rolling Spin Mop is like the Cadillac of wet mops. It has a superior agitation and wrings system. The bucket has wheels and a telescoping handle for easy transport. The mop pads are machine-washable. The O-Cedar Easy Wring Spin Mop and Bucket have a foot pedal to spin the bucket’s basket and wring out the mop. The splash guard helps keep the water in the bucket, not spilled on the floor. The triangular mop microfiber head pivots and fits into tight places. 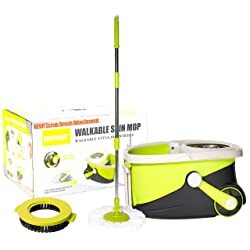 If you would like an all-in-one dry and wet mop system, check out the 18-inch Professional Microfiber Mop from Microfiber Wholesale that my family is using. The long handle is very comfortable for taller users. If your goal is to get a wet mop only, you have other choices. If you prefer a traditional bucket system, take a look at the Mopnado and the O-Cedar Easy Wring Spin Mop. Persons with back problems will especially appreciate the wheels and handle on the Mopnado. If you want a wet mop, but don’t need or want a bucket, consider the 18-inch mop from Microfiber Wholesale or the O-Cedar ProMist Spray Mop. Cleaning is all too often a chore instead of a pleasure, but the right tools make the job easier and faster. I hope this review helped you choose the best spin mop for your home, one that will save you time and effort. Thanks for the post. It’s the best spin mop review for me.